Professional Driver with stainless steel magnetic 1/4″ hex bit holder drive shaft. 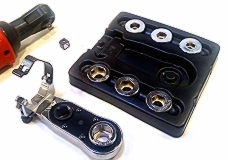 Bit storage compartment with unique patented bayonet-mount rotary palm saver bearing cap. Rugged diecast metal reversing knob and hardened steel triple planetary gear construction for long life.